Mason jars…..they are all over the internet, and so many people are incorporating them into their home decor. 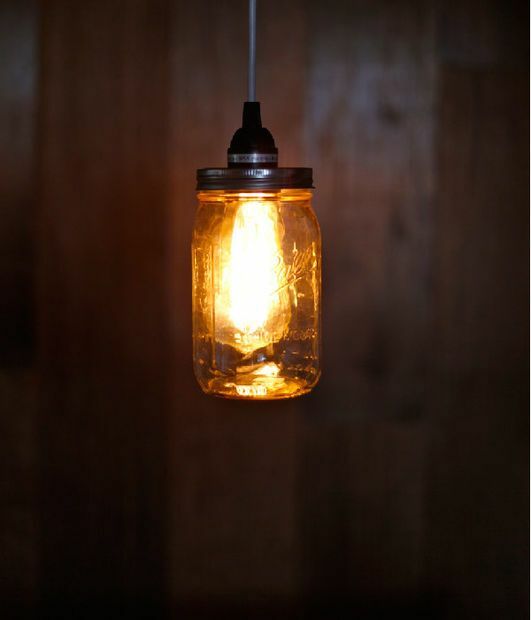 I am in love with how simple and beautiful this mason jar pendant light project turned out! You can use any style of light bulb you like– I happen to love the Edison Bulbs for their vintage charm! This mason jar pendant light fixture makes for great bedroom lighting, kitchen lighting, or you can even make a bundle of them for a mason jar chandelier over your kitchen table! Grab your nail and hammer, start punching holes along the inside edge of the circle. These holes will make it easier to cut the center of the lid out, so don’t be shy! .Now it’s time to remove the center of the lid. To do this, grab your tin snips (scissors may work too) and start cutting along the holes. Using your tin snips, cut the rest of the center piece out. Isn’t this perfect…..and so inexpensive compared to store bought! You can do it too! Now some of you will love the idea but think you can’t do it. It is a easy one, really! The hanging light kit makes it easy. Looks like an antique piece. Thank you! These are so easy to make.Thank you so much for stopping by Abhijit! The edison bulb does use more wattage. You can find UL approved light kits on Amazon. I am sure if a 25 watt bulb would be fine. Thank you! Have a great day!